A Big and Powerful Predator! It's one of the easiest and arguably, one of the most exciting of fish for an angler to catch. Northern pike fishing is something we do right up here in Ontario's Sunset Country! In fact, with over 200 outfitters offering the opportunity to catch 45+ inch fish that can weigh over 30 pounds well, do we really have to say more? Northern pike are easily the most successful predator in our waters. Some lakes have good numbers while other have good numbers with a high percentage of big fish - 36 inches or better - especially on some of the northernmost lakes. The truth is it's very easy to catch these toothy critters and you always have a chance at landing the big one and, who knows, maybe even the fish of a lifetime! These fished were designed to hunt and hunt they do. Nothing is safe from a northern pike - ducklings, muskrats, and any fish smaller than it is (even if just by a wee bit) are all fair game. Pike are excellent ambush predators often lying in wait behind a rock or in the weeds for its unsuspecting prey to swim by. Their long and slender body design is perfect for hunting and with one quick move of their powerful tail lunch is served! Find the perfect outfitter offering northern pike fishing here. You can also catch our big pike on the fly as The New Fly Fisher's Bill Spicer discovered! I'm sure just about everyone has heard the saying "it's not rocket science" - and this certainly applies to fishing for northern pike in Ontario's Sunset Country - albeit, even if you are a rocket scientist the pike don't really care. Fact is, anyone can catch pike and it is relatively easy to do in these parts - from shore, off a dock or out of a boat. The pike don't care what season it is either. You can catch them through the ice in the winter just as easy as you can from a boat in the middle of summer. Simply put, northern pike are hungry almost all of the time and they are constantly on the lookout for an easy meal when one presents itself. The smaller pike - I like ones between 22 and 25 inches long - are also excellent table fare. The key to eating them is to learn how to cut out the "Y-Bone" that runs through the filet. After a few times practicing, you'll find this is easy to do and once removed, pike are one of the tastiest fish that come out of our lakes. Jeff Gustafson with a Sunset Country brute caught while ice fishing. Sunset Country: Jeremy thanks for doing this! You have fished up here for pike in every season and under all kinds of weather conditions. What season do you like the most when it comes to pike fishing in Sunset Country? Jeremy: Hi Gerry, always glad to talk fishing. I love fishing for pike in every season but if I had to pick one, it would definitely be early Fall. Sunset Country: Why the fall? Jeremy: I like the slightly cooler weather and the big pike seem more predictable in the Fall. It's also easier to pattern their behavior in the fall and they do seem really hungry at this time of year! Sunset Country (laughing): My experience with pike is they're always hungry! What kind of structure do you look to fish during the fall months? Jeremy: Yep, they are always hungry but I think even more so in the fall as the water temps cool down, if not more hungry, they certainly are more active. As to structure, I almost always look to rocky structure - off points, gull rocks, reefs etc. These spots give them good cover and if possible, I look to current areas with rocky structure. You're virtually guaranteed to find at least one big pike in a zone like that and often, more than one. Sunset Country: Well we have no shortage of structure like that in our Canadian Shield lakes, so what do you prefer in terms of your approach - do you cast or troll for them at that time of year? Jeremy: Well, I do both depending on conditions but truthfully, I like trolling the best. You can cover a lot of water and zone in on the structure we talked about. Trolling a shoreline around a solitary island will often yield a hungry fish and as I said, if there's current present, you have a very good chance at landing a big fish using this method. Sunset Country: What kind of lures do you use most often? Jeremy: I like to troll big crankbaits, flat sticks and my favorite I think, is a jake! I usually troll between 3 and 4 MPH and I tend to stay a little further off the shore than I would fish if I were targeting muskie using this method. My go-to depths range between 12 and 18 feet most of the time. Sunset Country: Shortly after ice out, northern pike are one of the top species anglers go after given walleye season is closed for the spawn. What are your tips for our readers on spring fishing for pike? Jeremy: Well, the water temperatures are still pretty low at that time of year so I look for shallower, black bottom bays and I also look for these bays that are adjacent to a bog where meltwater is flowing into the lake. The main lake can still be frozen at that time of year so the pike prefers these slightly warmer spots in these back bays which usually melt first. Sunset Country: Interesting, how deep are the big northerns in the spring? Jeremy: I look to find the biggest fish in around 5 to 10 feet of water in the early spring. Sunset Country: What is your tackle selection and technique for early spring pike? Jeremy: In the spring, I like using size 12 X-Raps and large, soft plastics - they seem to work the best. In terms of technique well I cast for them and I use a twitch/pause retrieve with lots of hangtime between twitches. Sunset Country: Most anglers visit our region in late spring and during the summer. What tips can you provide for anglers targeting pike at that time of year? Jeremy: Anglers have more options in the late spring and summer. Most pike at that time of year are going to associate with the thermocline. The biggest ones will be found between 25-30 feet and I usually troll for them when I am fishing those depths. I like to use deep diving X-Raps and sometimes Sluggo boot tails. I also look for deeper weed lines on occasion and in early or late summer, there are pike holding in the cabbage grass beds. Sunset Country: I know you've been ice fishing up here many times and have caught some monster fish through the ice. Any tips you can think of for our ice anglers? Jeremy: Tip-ups are my secret weapon when I target big pike through the ice. I use dead ciscos and a large jig and the big fish often hammer these! Sunset Country: What's your overall impression of the quality of pike fishing in Sunset Country? Jeremy: Without a doubt, I'd put Sunset Country in Ontario at the top of my list for drive-to pike fishing destinations. They are everywhere in your lakes and I have seen several 45+ inch pike caught up there - even caught one myself! 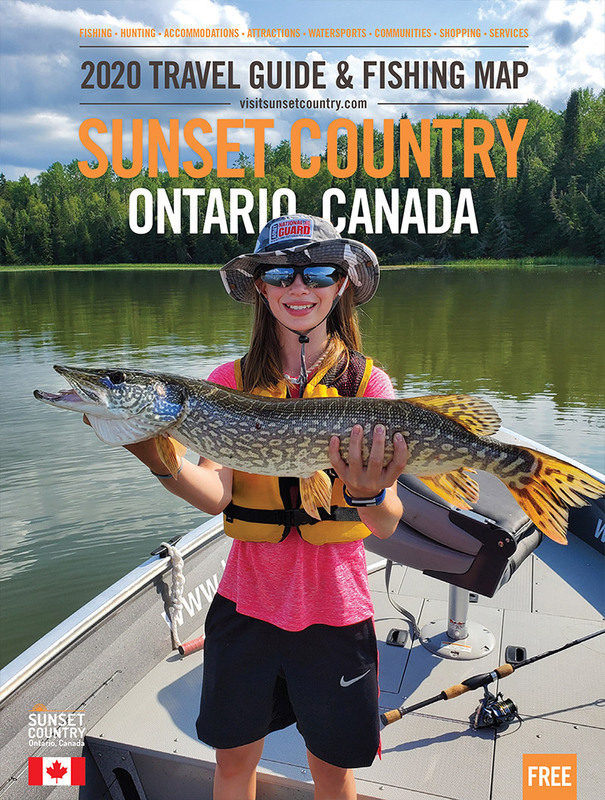 If you want a good chance at regularly catching pike in the 8 to 15-pound range - with a chance at a much bigger fish over 20 pounds - there's no better place for that than Ontario's Sunset Country. Sunset Country: Well, thanks, Jeremy, that's a good endorsement for us! All the best and we appreciate you taking the time for this interview! So there you have it, Sunset Country is indeed, a paradise of sorts when it comes to pike fishing. If you visit here, you'll definitely see lots of these predators in your boat, off the dock, or casting from the shoreline. You can also come during the winter and catch some big fish. Try to incorporate some of Jeremy's tips and suggestions into your approach and you will definitely be successful. If you do catch a big one, make sure you take a picture, release it and post the pic on our Facebook page. Pike are voracious predators and obviously, have no issue eating their own kind! Make sure you request your free copy of our 2018 Sunset Country Guide & Map! It's a great trip-planning tool and will help you to find the best place to stay in Sunset Country.